B. It makes no sense at all. Tonight I decided to grab one of those cabinet doors and do something with it. One of my favorite pieces of the last few months was the reproduction of a business card I did for my husband. 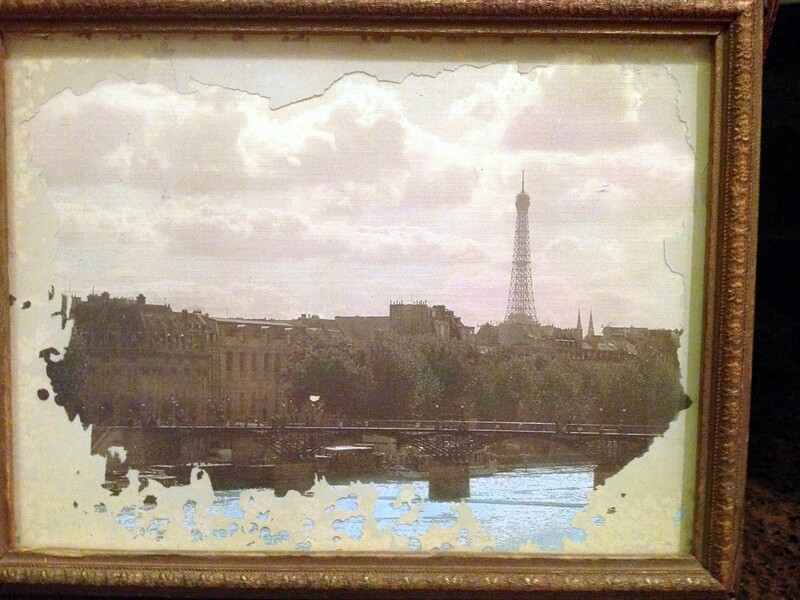 It was from the restaurant in Paris where we celebrated our 20th wedding anniversary. The piece now hangs in our kitchen. I took a larger cabinet door, some drop cloth fabric, glue, and gesso, to turn the door surface into something I can paint on. I prefer turning the door over where the trim is a flat panel. I glued the drop cloth down, not cut perfectly, but I plan on trimming it out anyway, and right now I am waiting for the first coat of gesso to dry. At this moment I’m not even sure what I will be painting on it, but I have drying time to brainstorm…Brainstorm is over. Valentine’s Day ahead, I’ve got an idea. A heart, not a cheesy red Valentine, but a tone on tone, thinking sepia, in the center, a lovely quote, again tone on tone, and random crap to be added to frame. Unfortunately the gesso isn’t dry, and it still needs another coat. Looks like a two-day project. While we wait for that to dry (Because aren’t we all waiting for me to be finished? ), I have another project. 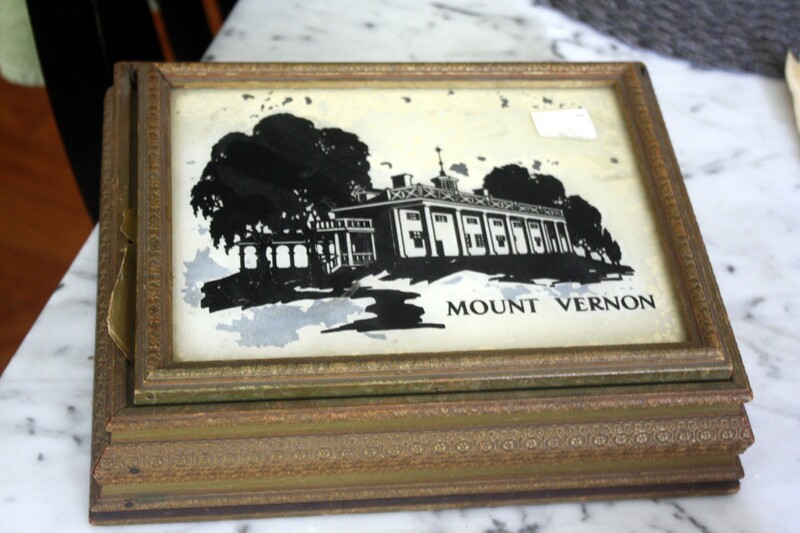 Years ago I picked up a vintage souvenir box from Mount Vernon at an antique store. The box was trashed on the inside. 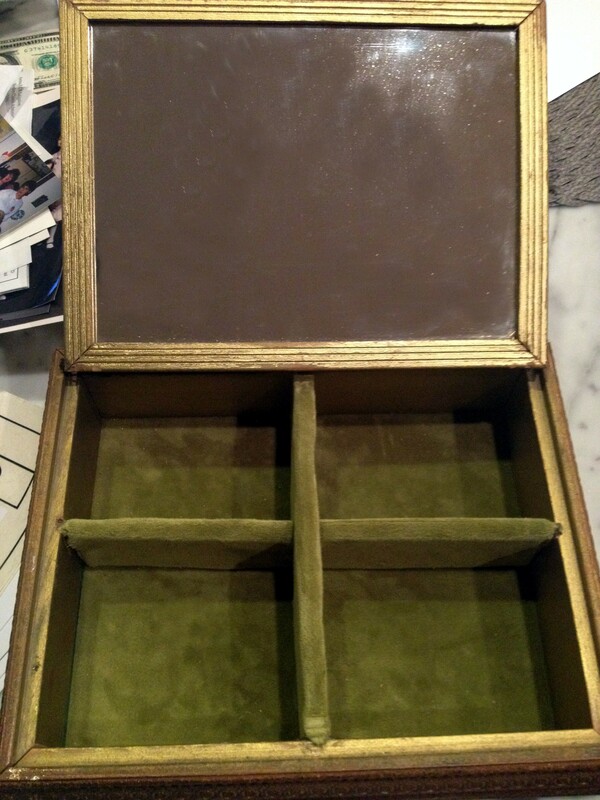 I redid the inside with some beautiful moss-green velvet. 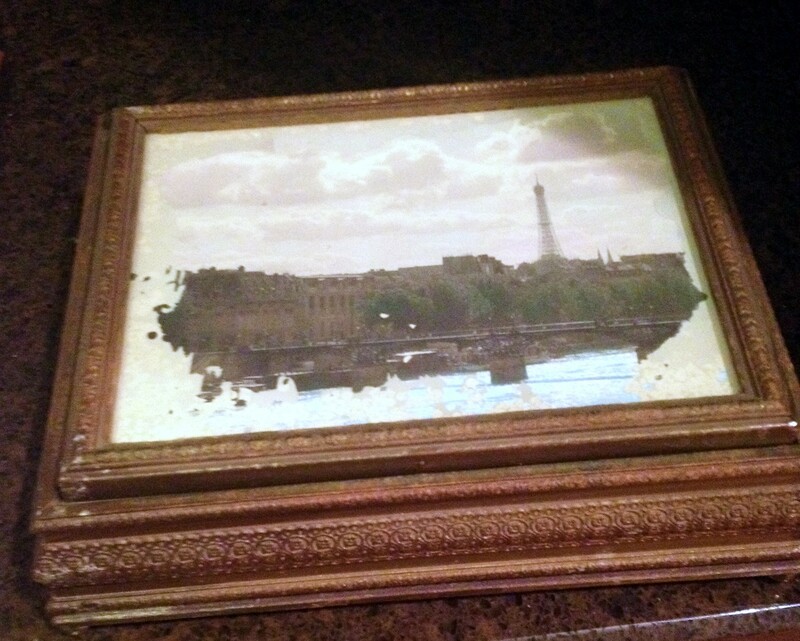 Tonight I replaced the top with one of my photos from Paris (note to Dan…Dear Dan, I must return to Paris, running out of photos to use, must return to replenish my supply…) The top had some flaking on the inside of the glass frame that I chose to keep, I like the patina of it. I think it came out really nice. Definitely one for etsy. Tomorrow I will return to my cabinet door. I hope to add an additional coat of gesso before bed tonight. 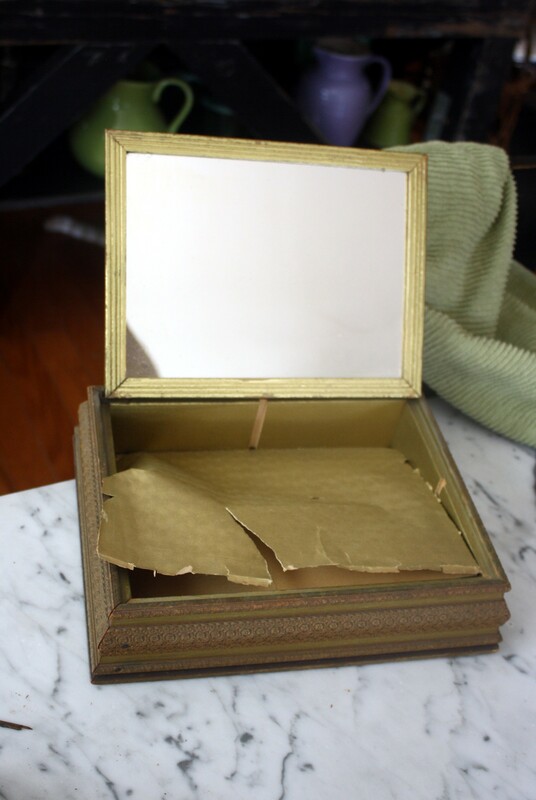 This entry was posted in art, Art and my life, Crafts, Fine Art, Humor, Recycling, Uncategorized, Words, Writing and tagged art, Crafts, Fine art, France, humor, life, Paris, projects, Recycling, thoughts, Vintage, Visual arts, writing. Bookmark the permalink.